Kentrol Inc.® introduced the idea of Stainless Steel Accessories for Jeep® vehicles in 1980. By manufacturing high-quality products from stainless steel, they have set the industry standard. 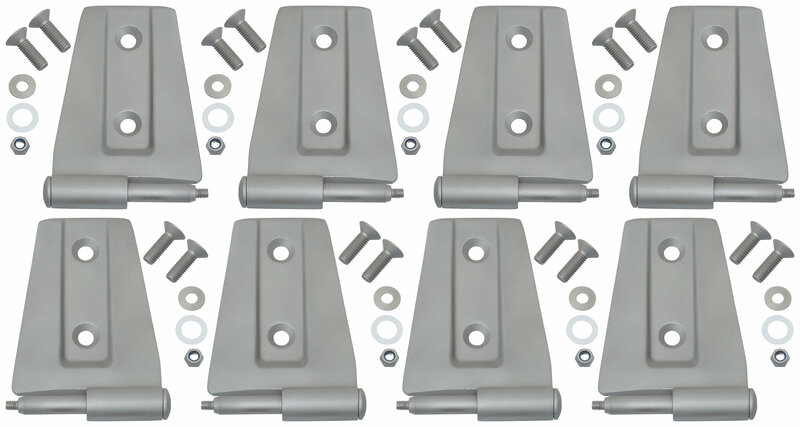 All products are produced from T-304 stainless steel, which is a non-magnetic and rust-free material.This door hinge set is Sand Blasted and ready to be painted. Kentrol inspects 100% of their parts before they ship. Attention to detail helps ensure the products you receive will be of the highest quality. Not all stainless steel accessories are created equal. Kentrol begins with mirror finish 304 and 410 stainless steel sheets and tubing that simply will not rust. Utilizing their own proprietary tooling and engineered drawings, Kentrol's Stainless Accessories are then stamped, drilled, machined, welded and polished to achieve the finest fit and finish possible. Kentrol's Hinges & Hood Vents are slightly oversized to cover over any paint seams or exposed body primer. Kentrol uses thicker raw materials compared to the competition and always includes high quality stainless steel mounting hardware. Kentrol delivers consistent quality and innovation and the finest stainless steel accessories for your money.